Check out the amazing range of material we have on this site for you to download at the What is Here Page and see some pics ! So what is Biogas? Biogas is a biofuel and it generally refers to the gas produced from organic matter as it is broken down by biological means. 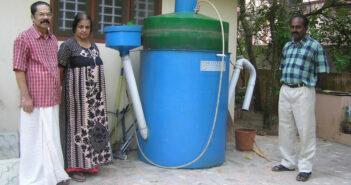 You can build a biogas plant for your home, community, at much larger commercial scales or a school project. Information, plans and designs are here for a range of applications. Biogas is often referred to as 'gobar gas' in India, a word derived from Hindi meaning cow dung. Biogas can be produced by anaerobic digestion or fermentation of biodegradable materials such as biomass, manure, sewage, municipal waste, green waste and energy crops. The biogas produced from a digester is comprised primarily of methane, carbon dioxide and other trace gases. When you build a biogas plant, methane, hydrogen, carbon monoxide and other trace gases are produced... but methane is the main combustible gas. Biogas is currently used as a low cost fuel in many countries for heating and cooking, and is also extracted from waste management facilities like sewage plants and landfill sites where it refined into biomethane and used to run engines to generate electricity. Biogas is classed as a renewable fuel, and generally qualifies for renewable energy certificates or subsidies in many parts of the world. Could you produce and use biogas? If you have any information, plans, links that might be useful to others, please contact me with details and I will load onto the site. Another type of biogas is generated from wood-gas which is created by gasification of woody materials or other biomass. We have a whole site devoted to wood gasifiers with hundreds of files which are free to download just like this site. Information and documents show you how to build gasifier stoves, gasification plants for stationary engines, transport and much more.